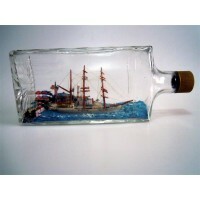 This is a diorama built in a bottle with the American Ship "Dina" anchored in a harbor outside a tow.. This is a diorama of a harbor scene and the Ship "Creif" and the Tug "Triton" created by Ship in Bot.. 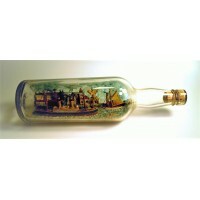 This is a scene of an Ocean Liner in a bottle flying an English flag sailing outside a town. 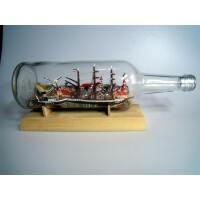 The uni..
Art in Bottles is your reliable source for the purchase of original, rare, antique, vintage, and contemporary ship, folk art and whimsey (whimsy) built in a bottle, light bulb or other glass container. The market for nautical, maritime and folk art is strong and continually growing among collectors. These Bottles will be great additions to your folk art or nautical collection and they look wonderful on mantles, desks, bookcases, and other prominent display areas. They are also amazing "hard to find" gifts for that special person on your list. Original one-of-a-kind works of art from over the past two centuries made by artists, living and dead, from around the world. These are some of the finest examples of Ships, Folk Art and Whimsey in today’s market. Art in Bottles is located in Owensboro, Kentucky in the United States of America. My wife and I have been actively involved in the buying, selling, research, and documentation of ships, folk art, and whimsey built in bottles and other glass containers since the 1980's. Over the years we have had the pleasure and enjoyment of owning one of the most extensive collections found anywhere in the world including bottles by the most well-known artists such as Daniel Rose, Carl Worner, Adam Selick, the Soldiers Home Artist, Jonny Reinert, George Fulfit, John Harmon, IOOF Chair Artist, Henry Poole, Caveman, Jacob Steur, G. Stengel, and many more. The bottles offered here for purchase have come from private sales, antique stores, the Internet. and auction and estate sales. 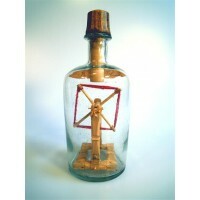 Now, through Art in Bottles you have the opportunity to own your own wonderful original folk art bottle. We do buy bottles regardless of condition. 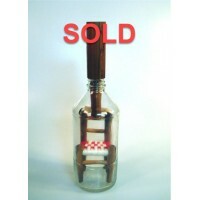 Please "Contact Us" if you have one or more bottles you are interested in selling. - this article first appeared in the April 14, 2015 issue of "The Journal of Antiques and Collectibles." This is a wonderful whole hull model of a 2 masted schooner built in a Phillips 40 watt light bulb. ..